As I wrote earlier, I spent some time in prayer this morning at the tomb of Pope John XXIII. I have been blessed to have this opportunity a number of times now, but the experience is always a profound one on many levels. I began an eight-year journey (1963-1971) in the seminary (high school and college) during his pontificate and the Council which he convened. Both have had an incredible influence on my life personally, ministerially, academically and professionally. 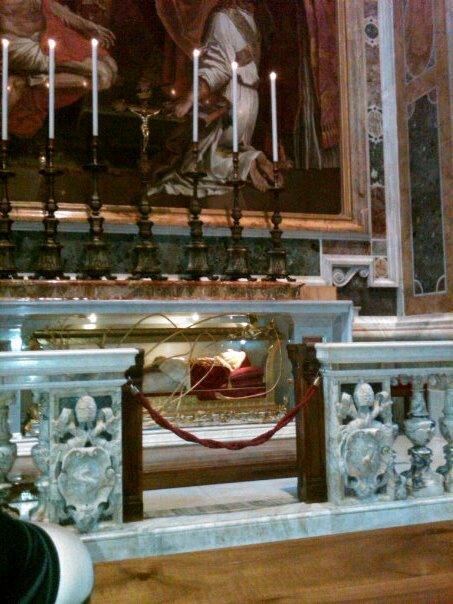 Today, as I found a spot near his tomb under the mosaic of the Death of St. Jerome, I noticed that the candles were lit at the altar [see the photo], reminding us, of course, that today is the Feast of St. Jerome on the Latin calendar. As I prayed the Liturgy of the Hours, however, something else struck me. Pope John died nearly 50 years ago. Those people who remember him and the events of his papacy (1958-1963) are now getting old (he himself once remarked, when he turned 60, that 60 was the age at which we begin to be old!). But something remarkable has always amazed me, and this visit was no exception. See, after you enter St. Peter's and work your way down the right hand side of the Basilica, the first big gathering spot for tourists is Michelangelo's famous Pieta "just inside" the front door; and now the next big stop is the new tomb of Pope John Paul II. Then you come to the tomb of John XXIII. Here's what amazed me: There were perhaps 200 people admiring the Pieta, and perhaps 100 or so at the tomb of John Paul II. But, in the hour I was there, a steady stream of pilgrims filed by John's tomb. I lost count after a couple of hundred, and the stream kept going. In fact, there were three security guards posted there to keep the crowd moving, quiet and prayerful. The memory of this holy man is still so strong and vibrant nearly 50 years after his death! He was able, in his quiet joy-filled way, to touch the hearts, souls and imaginations of the entire world, and his pastoral leadership style enabled the bishops of the world to rejuvenate the Church at the Council. As I prepared to leave, I approached one of the security guards and thanked him for his efforts. He smiled and said, "Ah, deacon, good Pope John still lives!" And so he does. . . . When I led a pilgrimage to Rome in 2005, one of the most memorable stops for my wife and I was on our "free day" (day without the tour guide). 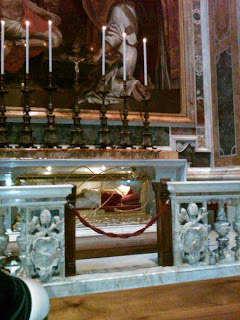 We walked through St. Peter's and were most moved by seeing the tomb of John XXIII. What a gift to the Church and the world he was. Hope you have a continued good time in the Eternal City. It was in October 2007 when I did the same visit to visit John XXIII but I cannot, right now, remember what we talked about. When I do my classes on Vatican II, invariably folks ask me about his personality. I describe him as a "big-huggy-bear"and folks just smile. The certificate of John's apostolic blessing, conferred on my future grandparents-in-law and their descendents, now resides over my desk. Like the guard's comment, the blessing is a reminder of what is. I am very devoted to "Buon Papa Giovanni," so it made my heart so happy to read this today. Thank you for your witness, of which he clearly has a large influence.